Delphi XE2 allows to develop iOS applications as well as applications for Win 32-bit, 64-bit, and Mac OS. In this article, we will try to explain how to develop iPhone apps in Delphi XE2. However, everything below can be used in application development for iPad and iPod, since they support iOS mobile platform as well. This is due to the fact that Delphi does not have a native compiler for iOS platform, and the FPC compiler should be used for compilation. Also, note that an iOS application can only work with several databases (where no client library is required, or if there is a native client for iOS). This restriction is due to the fact that, according to the Apple policy, iOS applications must not be written using external dynamic libraries, if only they are not built into the iOS SDK or statically linked to the application itself (you can find more detailed information at the Apple site). 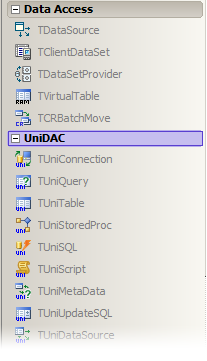 We have used UniDAC for developing our sample application, and all three databases are used in it. The process of application development using these products is similar to the one described below, except that you have to use the product-specific connection and query components instead of TUniConnection and TUniQuery listed in our code samples. 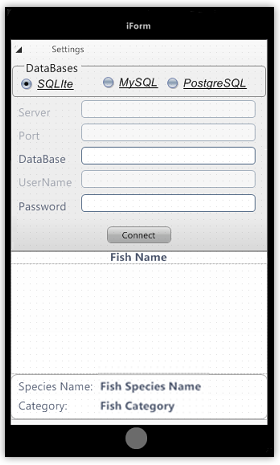 At the first stage, a new iOS application can be created using “File -> New -> Other -> FireMonkey HD iOS Application” menu. A new iOS application can be created Then the application is designed similarly to any other application, i.e. you can place visual components on the form, implement application logic, etc. Data-access components can not be placed on the form in design-time and have to be created, configured and released manually in runtime. There are some peculiarities when generating project-relative paths (for example, when setting a database name for the connection) in iOS. There is no possibility to set a link between data-access components and visual controls (for example, like connecting TStringGrid and a dataset with the LiveBindings mechanism in a trivial FireMonkey application). The process of displaying and editing data needs to be implemented manually. As you can see, in the code sample above we have used some GetDatabasePath function when setting the UniConnection.Database property. When the application runs in Windows, the function will return the application path. But, when the application runs in iOS, the function will return a path to the special Documents sub-folder located in the application root folder on the iOS device. The Documents sub-folder is automatically created for each iOS application when it is installed. All application data, including the database, has to be placed in this sub-folder. Unfortunatelly, there is no possibility to include the database file into the project in order to place it into the Documents subfolder automatically when the application is installed. Therefore you will have to copy the database file to the iOS device manually after installing the application. Then, the task is to display the data retrieved by the query in visual controls. As it is described above, there is no possibility in Delphi XE2 to do this in a way like using a TDataSource component in VCL, or LiveBindings in FMX. Developer’s own methods are required to be implemented for each specific case to display and edit data. Data editing also needs to be performed manually, i.e. you should call the corresponding Insert/Update/Delete methods, fill in the fields of a dataset with the right values, and then call the Post method, etc. 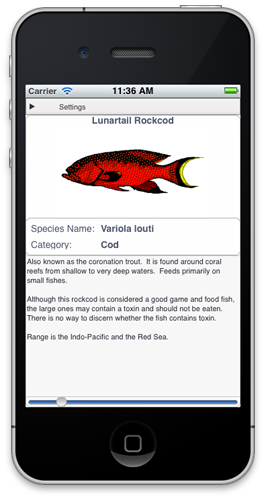 The second stage is compilation and deployment of applications directly to the iOS platform. Creating an Xcode project for the Delphi project. Compiling the Xcode project on MacOS. Deploying the application to an iOS device. 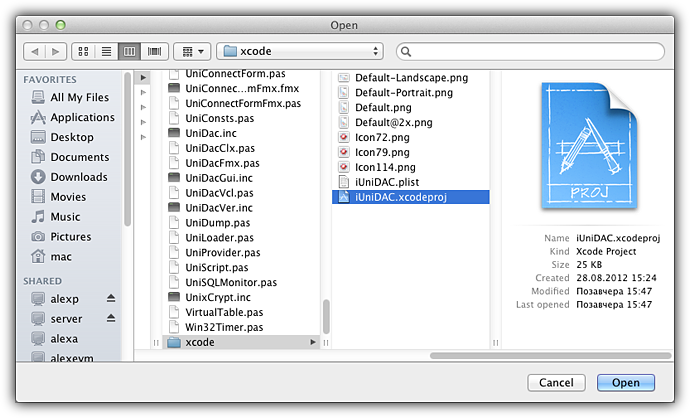 In order to compile a Delphi project on MacOS, a special Xcode project has to be created. The project consists of several additional files that are created in the “xcode” subfolder in the root folder of the project. To create an Xcode project for the existing Delphi project, the dpr2Xcode.exe command-line utility is used. The utility is supplied with Delphi XE2 and located in the Bin folder. 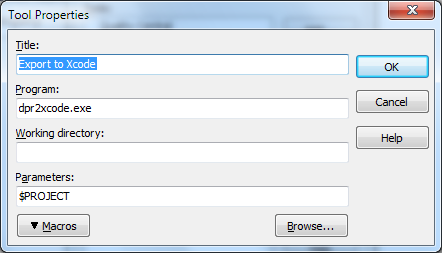 To make the usage of the utility more handy, you can customize the IDE Tools menu. Now you can open your iOS project in the IDE and use the “Tools -> Export to Xcode” menu to create an Xcode project. As it described before, after doing this, the “xcode” subfolder will be created in the root folder of the project. Then, it is nessessary to copy all UniDAC source files into the iOS project root folder, because UniDAC files will also be required by the FPC compiler to build the project. Now, the iOS project is ready to be compiled with Xcode on MacOS. So, if you have an appropriate MacOS system, you should copy the project folder to MacOS, open the project in Xcode, then select an appropriate output device in Xcode (a real iOS device or a simulator) and build the project. When a simulator is chosen as an output device, then after the successfull building, the application will be opened in the simulator directly on the MacOS system. When a real connected device is chosen as an output device, the application will be automatically transferred and installed on the device, and its label will appear on the device desktop. Also, since all the source files are transferred to Mac OS, there is a possibility to debug the application directly in Xcode. The application deployment process is not the objective of this article, it is widely described in Internet. As mentioned above, you do not have to deploy any additional libraries with an application written using UniDAC, PgDAC, MyDAC, or LiteDAC. Also note, that in order to develop applications on a real iPhone, iPod, or iPad, you have to sign up for the Apple’s paid iOS Developer Program and configure the device for development purposes. You can find out more about the iOS Developer Program here. Without this license, the application can be only tested in the iOS simulator included in Xcode. This article it’s perfect to probe the devart components. Could you update the article for XE4? I am unable to make it work. Even so the dB Sems to be in documents the program does not find it. Is there a way to update the dB via iTunes? Please have a look at the How to Develop iOS Applications in Delphi XE4 Using Devart Data Access Components article. Thank you! We hope the article was useful for you.